Edge on Science is a place where your child has the freedom to explore applied science & engineering. Individual and team projects make it a hands-on experience. 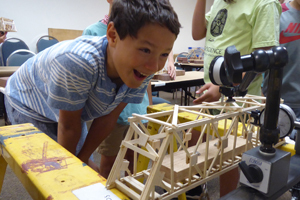 From rockets to computer coding, choose from ten different, fun-filled weeks of STEM camp! Whatever skills or abilities your child brings, we meet them where they are and then guide them to the next level. Along the way, they will unplug and make new friends. It’s what we do! Lead instructors are engineers, scientists and/or scholars. And the child to instructor / assistant ratio is 7:1 or less, which means a custom experience for your child, with individual attention. Choose from rocketry, bridge building, catapult engineering, hydraulics, microscopy & biomimicry, optics & astronomy, drones & computer coding and drone racing. We use engineering drawings, tools, instruments and computer simulations, as we design, build and test. Games and challenges add to the fun! You may also bring an Edge on Science custom program to your school, community or youth group. Just call and ask.